The Isthmus of Corinth forms a physical link between most of contiguous Greece and the Peloponnese Peninsula. 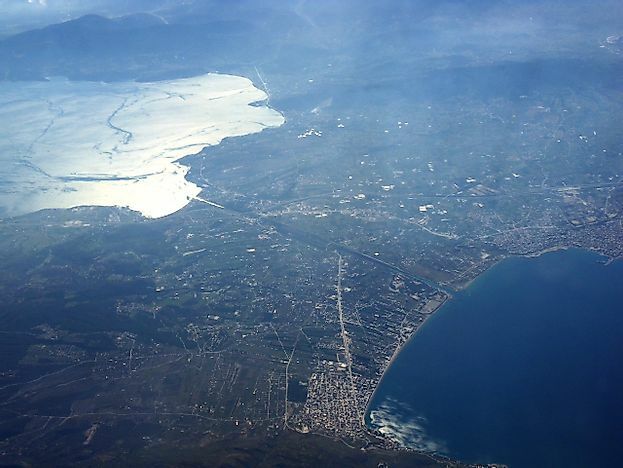 An aerial view of the Isthmus of Corinth. The Isthmus of Corinth forms a physical link between mainland Greece and the Peloponnese Peninsula. In the past, the ancient city of Corinth, located on the isthmus, profited extensively from this natural land bridge. The critical location of the city made it a gateway for trade to pass through to get to the Greek mainland, Asia, and Italy. The ancient Romans used the isthmus to expand their conquests to Greece during the era of the Roman Republic. Today, the site has two railway bridges, two road bridges, and two submersible bridges with a military emergency bridge at its west end. The isthmus was first inhabited around 5000 BCE and achieved prominence during the 10th century BCE. Prehistory witnessed a long line of ancient kings ruling the region. The city of Corinth was founded in 750 BCE on the isthmus by the descendants of King Bacchis. In 657 BCE, the tyrant Cypselus raided the city and successfully took over the reigns of power, later succeeded by his son, Periander. Cornithian pottery dominated the Greek pottery market between the 8th century BCE to the 6th century BCE. The Isthmus of Corinth is an important byway for trade and commerce as well as a significant cultural landscape in Greece. In 1830, the idea of the Corinth Canal was proposed just after Greece achieved its independence from the Ottoman Empire. Construction of the canal started in 1882 and was completed in 1893. It has a length of about 4 miles and a width of 70 feet. For some decades, the canal was crucial for trade and commerce in the area, but as the 20th century progressed, the Corinth Canal lost its economic importance. Most modern wider ships could not pass through its narrow waterway. Landslides occasionally made the canal a risky proposition. Despite these design defects, the Corinth Canal still has about 11,000 ships using its waterway annually, mostly tourist cruise ships small enough to navigate through its passage. Corinth on its isthmus features a mountainous landscape replete with castles and towers surrounded by lakes and forests. The modern tourist will encounter ancient Greek and Roman ruins. Forest stands of fir, black pine, and juniper complement ancient mythological caves inhabited by deities. The connecting Peloponnesian region has wetlands, lakes and valleys also linked to ancient Greek mythology. Vineyards and wineries are also a feature of the place. Cherries and raisins are two important products of the region. Lake Stymphalia is populated with fish and is also home to a rare estivating fish. Around the lake are about 133 rare bird species. Whales, dolphins, and sharks make the waters surrounding the isthmus an interesting area for swimming and snorkeling. The Greek Ministry of Culture is responsible for the country's cultural heritage and its preservation. The Isthmus of Corinth and the Peloponnese Peninsula have many ancient sites that are considered cultural treasures and important archaeological heritage sites. Closely linked with these conservation projects are other conservation concerns in the region such as the widening and expansion of the Corinth Canal. The Ministry of Finance is responsible for this project as part of the 2013-2016 Strategic and Operational Plan of the Corinth Canal. The Corinth Canal Company will be shouldering the financial aspect of the project. The current width of the Corinth Canal will be widened from its original 70 feet to about 144 feet, doubling its capacity to accommodate larger ships. Tourism and outdoor activities will also be part of the project. Where Is The Isthmus of Tehuantepec?